Rashes, acne, boils or abscesses on the scalp can be alarming and painful--scalp skin is sensitive, usually protected by the hair above it. These conditions may be caused by ingredients in shampoos due to overuse, improper rinsing or an allergic reaction. If you are experiencing sores on your scalp, consider switching shampoos and speak to your doctor or dermatologist to find the cause of the problem. Detergents are the ingredients used in shampoos to bind with oil and dirt so they can be rinsed away. 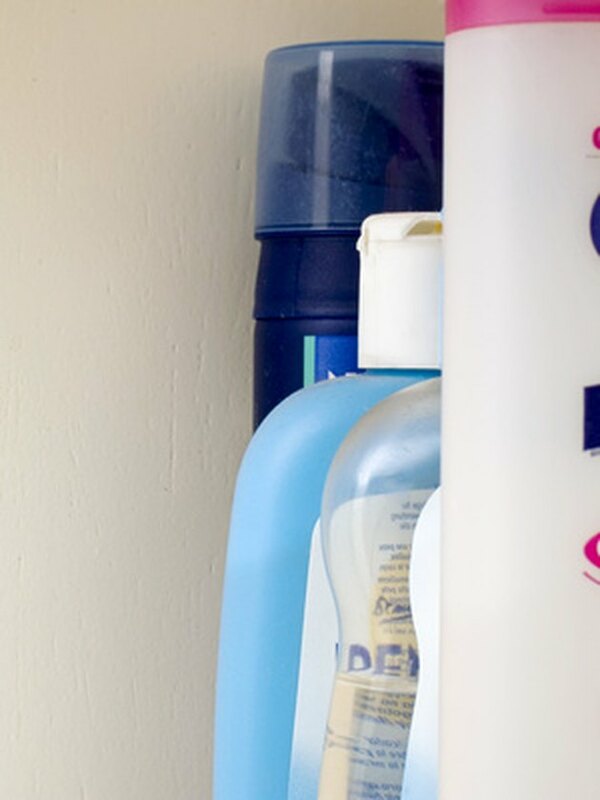 Common detergents in shampoos include sodium lauryl sulfate, sodium laureth sulfate and the related ammonium lauryl sulfate and ammonium laureth sulfate. These ingredients are also surfactants--ingredients that change the surface tension of water. They are responsible for the thick foaming or lathering action provided by some shampoos. Sodium lauryl and laureth sulfate have been identified by the Cosmetic Ingredient Review, or CIR, as irritants when studied in lab rats. In a published statement, the CIR found that sodium lauryl sulfate and the related ammonium lauryl sulfate caused greater irritation to skin the longer the chemicals were in contact with the skin, especially when the concentration of the ingredients was above 2 percent. The CIR notes that “severe epidermal changes” were found in test subjects, and that a concentration of 1 percent to 5 percent caused an increase in acne when tested on albino rabbits. Sodium laureth and ammonium laureth sulfate were similarly tested, and while these ingredients produced similar irritating effects, the irritation was not of the same intensity. TEA-lauryl sulfate, or triethanolamine lauryl sulfate, is another detergent, surfactant and foam-boosting chemical found in shampoo. While the Cosmetic Ingredient Review board found the chemical safe in concentrations less than 10.5 percent for rinse-off products like shampoo, and less than a 5 percent concentration for pure triethanolamine, the FDA adds additional qualifications for shampoos containing triethanolamine and its derivatives. When a triethanolamine ingredient is in the same formula as a nitrosating chemical, such as hydroxymethyl, nitromethane or sodium nitrate, carcinogenic chemical byproducts called nitrosamines occur. Determined dangerous by the FDA as early as 1977, nitrosamines penetrate skin and cause damage to skin cells, including sores, as noted in a Cosmetic Ingredient Review statement, supported by the book "Cosmetics Unmasked." Fragrance is what gives shampoos their pleasing scents. Sometimes fragrance agents are identified by name--geraniol, linalool and citronellol are just some examples of naturally-derived fragrance chemicals. Sometimes the term “fragrance” is listed among ingredients. Unfortunately, a listing for fragrance or parfum can indicate the presence of up to 4,000 different chemicals, as noted by “Cosmetics Unmasked.” Among the chemicals that "fragrance" may indicate are organic chemicals, such as the aforementioned fragrance agents, or less obvious ingredients, including acetone, an ingredient in nail polish remover, and formaldehyde, a tissue preservative. Organic chemical ingredients in fragrance may trigger an allergic reaction to those with plant sensitivities; people who are allergic to roses and geraniums may find themselves with a sore or rash after exposure to geraniol. Citronellol and linalool are derived from citrus fruits, which are highly acidic, altering the pH level of skin and causing sores. Any number of chemical ingredients in the generic “fragrance” listing have the potential to cause scalp sores. Even essential oils used in organic or natural shampoos can cause allergic reactions that lead to sores on the scalp. Penetration enhancers are seen most commonly in moisturizing shampoos or two-in-one shampoos and conditioners. These ingredients increase the amount of moisture that penetrates the hair follicle by chemically altering the structure of the hair to allow entry to emollient ingredients. These same ingredients work similarly on skin, according to “A Consumer's Dictionary of Cosmetic Ingredients.” Absorption enhancers include propylene glycol, ammonium glycolate, disodium EDTA and lecitin. These ingredients usually serve double duty as humectants or preservatives. Although approved by the FDA for use in cosmetics, penetration enhancers may cause long-term damage to your skin and hair, as stated in “Cosmetics Unmasked.” Because they push chemicals deeply into the skin and hair, these ingredients may ravage your skin over time, causing dryness, sores, rashes and an overall feeling of pain or itchiness. Can Certain Ingredients in Shampoos and Conditioners Cause Hair Loss?